Hibiscus is known for its sweet-and-sour taste and vibrant color, but it actually has a history of herbal use that dates back thousands of years. Known for its sweet smell and beautiful blooms, hibiscus has been an ornamental symbol of tropical lands for thousands of years. Few today, however, are aware of its fascinating origins and wealth of practical uses. The flower can act as food, medicine, and even clothing when fashioned in the right way - and its popularity outside of tropical lands only continues to grow. Inducing bowel movements. Organic acids in this plant can't be reabsorbed by the intestines, which helps to relieve constipation. Lowering blood pressure. Preliminary studies show that hibiscus can reduce blood pressure and other cardiovascular risk factors. Treating respiratory infections. Hibiscus tincture has some antibacterial activity. The plant is also used topically to treat skin conditions such as eczema, and folk traditions claim it can be used as a hangover cure and aphrodisiac, although little scientific evidence exists to support such uses. Traditionally, African herbal medicine used hibiscus as a common cure-all for loss of appetite, the common cold, and respiratory ailments. It was probably effective in these capacities because of its immune-modulating polysaccharide and vitamin C (ascorbic acid) content. Hibiscus is primarily comprised of organic acids, including citric, malic, and tartaric acids as well as vitamin C (ascorbic acid). Pectins, flavonoids, and mucilage polysaccharides are also present, bringing mild laxative, expectorant, and diuretic action. Flavonoids such as anthocyanin and beta-carotene are additionally found, as are some alkaloids and trace amounts of glucose. THE MUCILAGE IN HIBISCUS COATS MUCOUS MEMBRANES TO SOOTHE THEM. Herbs that are also helpful for aiding constipation and digestion are prune, rhubarb, and tamarind, while hypotensive properties can be found in mesquite and saffron. While hibiscus does not usually produce side effects, it is contraindicated in certain conditions and can interact with some medications and herbs. Those with diabetes or low blood pressure, as well as those taking medicine for these conditions, should avoid hibiscus. 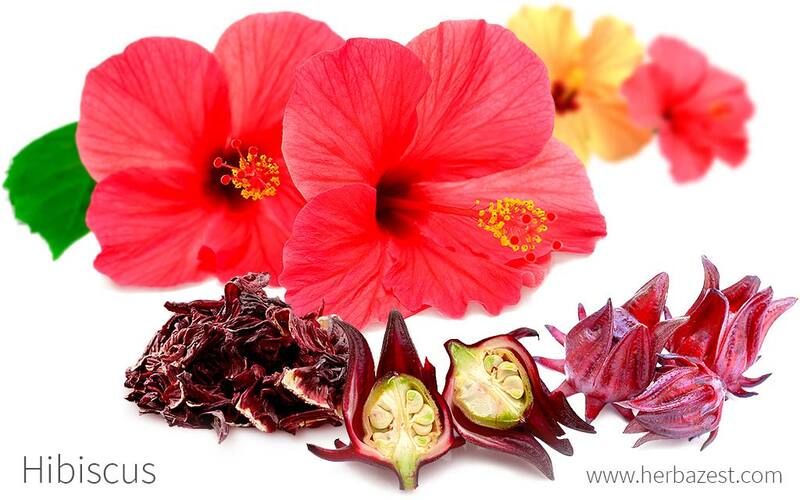 Additionally, pregnant and breastfeeding women should not take hibiscus. Those taking chloroquine for malaria should not take hibiscus, as the herb can make the treatment less effective. Any hibiscus use should be stopped two weeks before a scheduled surgery. Hibiscus is also consumed as an alternative health drink that is sweet, sour, and caffeine-free. Its flowers and calyxes are also a popular additive to desserts, jellies, syrups, and wine, and its leaves are sometimes eaten raw in salads. The calyxes are rich in vitamin A and potassium. However, the remedial forms of the herb concentrate its properties for medicinal uses. Infusion. Brewing its dried upper parts is the most common way to consume hibiscus. Typically, 1.5 grams are used per cup of water. Tinctures. Hibiscus tinctures are typically used for antibacterial purposes. Capsules. Hibiscus supplements provide a consistent dose of hibiscus extract. Tropical regions that boast widespread hibiscus cultivation can easily provide the plant year-round, but those living in more temperate climes are likely to only find dried calyces readily in ethnic markets and specialized health food stores. Teas may be easier to track down in grocery stores and supermarkets, alongside marketed processed foods and drinks that feature the plant's flavor and nutritional value. Those hoping to find hibiscus in supplemental form may struggle, as the product is not commonly sold on the market today. However, some wholesale retailers may carry capsules and oil extracts, and online outlets are particularly helpful in finding the right concentrations and prices to fit individual needs. Capsules are generally preferred, as they do not require mixing with other elements, though both should be used in moderation. Perennially grown in the tropics, hibiscus responds best to constant sun and relatively high temperatures ranging from 55 - 81°F (12.5 - 27.5°C). That said, flowers are sensitive to daylight, and they will not bloom if daily exposure is less than 11 hours or more than 13 hours at a time. A humid atmosphere and acidic, loamy soil are ideal. The plant will tolerate flood conditions and heavy winds but not frost or fog. It can be grown as an annual plant further north, flowering in late autumn months. More detailed information about growing hibiscus can be found in the herb garden section. Standing up to 13 feet (4 m) tall, hibiscus features an erect stem with lobed leaves and pale yellow flowers, the latter contained in a bright red, fleshy pod known as a calyx. Calyces are the most widely used part of the plant for their concentration of nutrients and sweet-sour flavor. A member of Malvaceae, or the mallow family, hibiscus (Hibiscus sabdariffa) is connected to nearly 2,300 other species of flowering plants, most notably including okra, cotton, and cacao. There are two distinct varieties of hibiscus: Hibiscus sabdariffa var. sabdariffa, which is more commonly used for food and drink purposes; and H. sabdariffa var. altissima, which is inedible but particularly useful for creating fiber. Other members of the Hibiscus genus are not to be confused with H. sabdariffa, although they share a common name. The majority have no medicinal value, despite their other pleasing aspects. In sub-Saharan West Africa, hibiscus has been used since time immemorial as a medicinal cure-all for mild and serious conditions alike. From there, the plant spread east across the continent and up through the Middle East, whence it was transported to Asia and became renowned for its myriad of uses. When the European slave trade started to pick up steam in the 15th and 16th centuries, residents who were captured and brought to the Americas carried the flower in their parcels and later spread it throughout the Caribbean, where it was employed chiefly as a fiber. Crop cultivation of hibiscus is a major industry in several tropical countries and further contributes to the national wealth. Thailand, India, and Bangladesh are the leading producers today, representing roughly 90% of the jute production industry. In Sudan, however, the flower is also listed among the top ten foremost crops annually grown, with dried flowers generating just over $14 million USD in 2012 alone. Caribbean nations, such as Cuba and the U.S. Virgin Islands, also benefit from its export. Gardening. because of its aesthetic beauty, hibiscus is often used as an ornamental in gardens and parks. Crafts. The plant is chiefly applied to making jute, a fiber common in developing countries as rope that is sometimes then used to make clothing, bags, carpet backing, and floor coverings. Dye. A yellow dye can also be extracted from its flowers' petals.